»Baptism for the Dead»Sealed Servant? This past weekend, I had occasion to attend an unusual sealing ceremony. One of my wife’s co-workers is in her 70s. Her husband passed away last year. Yesterday she was sealed to her dead husband. Her son served as proxy for her deceased husband. (Incidentally, she has been married and divorced to 2 other men previously.) Back in 2011, I discussed the change initiated in 1969 by Apostle (and future President) Howard W. Hunter in which women are now sealed to all their previous husbands, with the understanding that God will work out the sealing. It seems that my wife’s co-worker made the decision who she wants to be sealed to in this life, but in 100 years, someone will notice that she wasn’t sealed to her first husband and will probably seal her to her other 2 husbands. With February being Black History Month, it got me thinking about another unusual sealing performed sometime between 1894 and 1902. 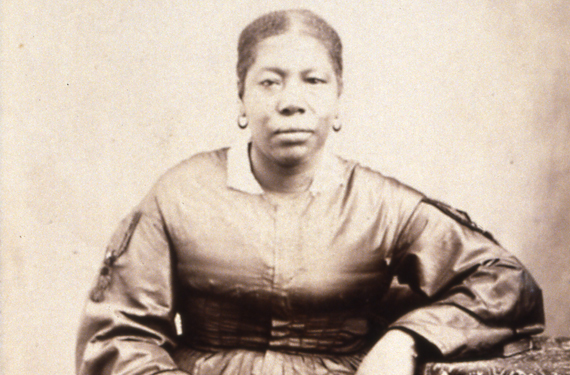 In my previous post on The Mormon Church and Blacks, there is some correspondence between Jane and various church leaders in which she asks for the endowment and sealing ordinances. Bringhurst and Harris include excerpts from some of these letters. Her first letter is dated Dec 27, 1884 and is addressed to President John Taylor. I enclose your recommend properly signed,–which will entitled you to enter the Temple to be baptized and confirmed for your dead kindred. You must be content with this privilege, awaiting further instructions from the Lord to his servants. I am your servant and brother in the Gospel. There are a few other letters in the book, but let me get to the last document which is titled “Minutes of a meeting of the Council of the Twelve, January 2, 1902.” In response to her repeated requests, a compromise was made in which Jane was sealed as a “servant” of Joseph and Emma. The wife of Isaac James (known[n] as Aunt Jane) asked to receive her own endowments and to be sealed; but Presidents Woodruff, Cannon, and Smith decided that this could not be done, but decided that she might be adopted into the family of Joseph Smith as a servant, was done, a special ceremony having been prepared for the purpose. But Aunt Jane was not satisfied with this, and as a mark of her dissatisfaction she applied again and after this for sealing blessings, but of course in vain. We had a Meeting with several individuals among the rest Black Jane wanted to know if I would not let her have her Endowments in the Temple[,] this I could not do as it was against the Law of God As Cain killed Abel All the seed of Cain would have to wait for redemption until all of the seed that Abel would have had that may come through other me can be redeemed. If she had to wait for Abel’s seed, we know that means never. So on the one hand, I can appreciate Woodruff for trying to accommodate Jane through a special sealing ordinance. On the other hand, slavery was abolished in 1864 with the Civil War. Jane is being sealed as a “servant”??? Is that a euphemism for a slave of Joseph and Emma? I had hoped to show her sealing had already been completed, but a quick search of FamilySearch shows that someone has reserved her baptismal ordinances back in 2014. Does this person not know that Jane died in the faith and does not need her baptism? I know Margaret Young has done extensive research on Jane James, and I thought Jane’s temple work had been completed back in 1978, but if that’s the case, it isn’t shown on FamilySearch. My real question is this? If the sealing power is to bind on earth and in heaven, what do you make of this sealing ordinance where she was sealed as a servant? Does this have efficacy in the next life? Are you proud or ashamed (or both) that Woodruff sealed her as a servant to Joseph Smith? I’m happy President Woodruff attempted a compromise that he felt could still work with the rules as he understood them. It looks condescending now, but I think cultural norms need to be taken into account. I still get weirded out that my great-grandma’s little sister who died as a child was later sealed as a wife to her brother-in-law (based on the reasoning that people need to be sealed to a spouse for salvation). People had different views of sealings at various times in the past. I suspect in another 50 years my grandkids will scratch their heads at some of our current beliefs and practices. Mary Ann, I tend to agree with you that the ceremony is not valid, but it brings up an interesting conundrum for more literal believers. In that sealing ceremony I attended, the sealer emphasized the April 3, 1836 vision of Elijah’s return to the Kirtland Temple where Joseph Smith received the power to “bind on earth and in heaven.” If we believe that prophets hold the keys of the sealing power, what’s to prevent this sealing from being bound in heaven? If if this sealing is not binding, are other sealings binding, such as sealings of a woman to her many husbands? And the slippery slope begins. I don’t know how anyone could review our post-Joseph doctrines regarding sealing and conclude we at all know what we’re doing. And if that is the case, what does that say about our supposed “keys” and the authority claims of Church leaders? MH, often in religion classes people will point out the difference between a sealing and being sealed by the “Holy Spirit of Promise.” Although the sealing is thought to be required in this life by a mortal person holding authority, the sealing is only valid insofar as it meets the criteria that the Holy Ghost defines. Usually we talk about this in terms of righteousness – those who are sealed to family members not living up to their covenants do not expect those sealings to remain valid in the eternities. Sealings that were done inappropriately (for example, when the wrong spouses are sealed together through temple work for the dead), are also not expected to have efficacy in the next life. There still appears to be a measure of agency involved. The sister of one of my ancestors was sealed as a plural wife to Brigham Young. To our knowledge, there is no evidence the marriage was ever consummated and she was one of the first to request a divorce when Brigham allowed it in 1851. The sealing, however, was not cancelled. Later, family members sealed her posthumously to her husband in this life. When she has the option between those sealings, who can say which one she will choose? She clearly expressed her opinion in mortality that she did not wish to be tied to Brigham’s dynasty, even though the sealing was in force. For whatever reason, our understanding right now is that we must still go through the motions of the various ordinances (including sealings) in this life, whether living or posthumously. God recognizes the power of those holding authority in this life to seal for time and eternity, but it seems that there will be some other criteria to be met in the afterlife for those sealings to be effective. As far as sealings to multiple spouses (wife to various husbands, husbands to various wives), I don’t know that we really have the whole picture. Polygamy allows the single husband to various wives, but how do we account when those same wives have various husbands? What about a woman sealed to several husbands (maybe because she was widowed in the previous circumstances) – if she only gets to keep one and the other husbands do not have other wives to be tied to, are they just out of luck in the eternities? What about the children tied to those other husbands, are they suddenly not sealed to parents anymore? We assume those who die single in this life (whether they die as a child or adult) will have opportunity to marry in the next life. If polyandry is not allowed, then will the same option be given to husbands who are left without wives? What about those who must wait to the next life to be married, are they just out of luck as far as bearing children and being sealed to them? I really don’t think we have a good grasp on what spouse or parent/child relationships will look like in the next life. It’s probably why the future spectre of polygamy doesn’t bother me as much since I believe agency will be a major factor. I can’t really provide a solid backup argument for that belief using doctrine and scripture, though. More a personal gut feeling. Mary Ann, you bring up some excellent points and questions! I love the sealing ordinance between ONE man and ONE woman. Beyond that, it doesn’t make much sense to me (even the concept of being sealed to parents.) I also remember a post at W&T, BIC: What’s the point? The fact is, we do misunderstand the sealing ordinance, and I do think that posthumous polyandrous (and well as polygynys) sealings just don’t make any sense to me. I’ve done another post on children sealed to each other, yet never married. Daynes indicates that 12-year old Mary Dunn and 11-yr old Mosiah were sealed to each other just prior to leaving Nauvoo because leaders knew it would be a long time before they had access to a temple. Daynes quotes Mosiah’s autobiography on page 78, ‘that it was done “with the understanding that we were not to live together as husband and wife until we were 16 years of age.”‘ Daynes further indicates on page 79 that “Mosiah and Mary were never united after they arrived in Salt Lake City; at age eighteen, Mary married Martin Luther Ensign.66“This logic reminds me as similar to the logic applied by Catholics when they baptize infants. There have been some really weird sealings, and I do think that some of our sealings today will cause future generations to scratch their heads. I do think God wonders what we are doing sometimes. Hi, MH! You don’t have to post this, because it’s a picky grammar Nazi post, but the general rule for parentheses is that the period goes inside the closing parenthesis when the parenthetical is a whole sentence. The period is supposed to go outside the closing parenthesis sometimes (when the parenthetical is part of a sentence). I’m pretty sure my eighth grade English teacher gave it to me straight. I should hire you to be my editor!